AJ Moore's life has changed - drastically. And her lover, Captain Finn Murphy, refuses to explain how that happened. His only concern is to hand over an ancient necklace, and the stone within it to his worst enemy, Beckworth, the Viscount of Waverly Manor. The fact the stone can ... read full description below. AJ Moore's life has changed - drastically. And her lover, Captain Finn Murphy, refuses to explain how that happened. His only concern is to hand over an ancient necklace, and the stone within it to his worst enemy, Beckworth, the Viscount of Waverly Manor. The fact the stone can return AJ to the only life she knows seems of little importance to Finn. After Finn abandons AJ at Beckworth's home, she soon discovers she's not alone. Maire is a long suffering guest of Beckworth and becomes AJ's only comfort. With only one direction to follow, AJ and Maire escape and join together to follow the stone and learn its secrets, if they can only stay one step ahead of Beckworth and his men. Yet nothing can relieve AJ's sense of betrayal from the one person she still craves to have by her side - Finn Murphy. If she would listen to her hear, AJ might discover that the fastest way home is with the one who chases her. 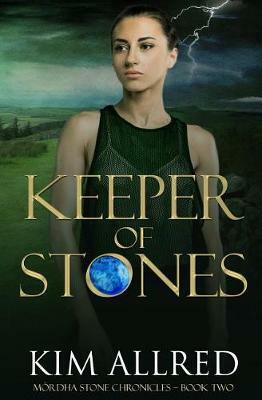 NOTE: KEEPER OF STONES continues the journey of AJ and Finn and concludes in TORC OF STONE. The first chapter of TORC OF STONE can be found at the end of KEEPER OF STONES. I hope you enjoy the adventure. Kim Allred lives in an old timber town in the Pacific Northwest where she raises alpacas, llamas and an undetermined number of free-range chickens. Just like AJ and Stella, she loves sharing stories while sipping a glass of fine wine or slurping a strong cup of brew. Her spirit of adventure has taken her on many journeys including a ten-day dogsledding trip in northern Alaska and sleeping under the stars on the savannas of eastern Africa. Kim is currently working on the next book in the M rdha Stone Chronicles series and her upcoming new sizzling romance series-Masquerade Club.